I used to visit Naples pretty regularly, but somehow I had let the months slip by and it was now years since I been. A few weeks ago Culinary Backstreets invited me down for a few hours of non-stop eating. 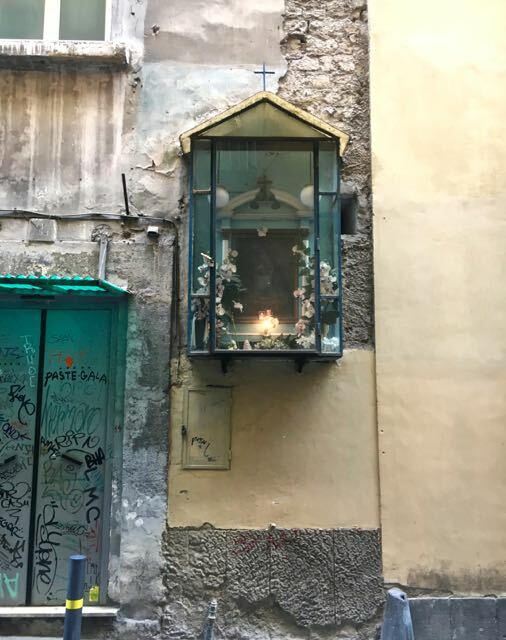 I left on an early train from Termini and arrived early enough in Naples to squeeze in a visit to the astonishing Veiled Christ at the Museo Capello San Severo. The entire chapel is pretty spectacular and if you spend a long time it will take about 20 minutes. You will have to take my word for this as no pictures are allowed. Don't miss the creepy-cool skeletons downstairs. 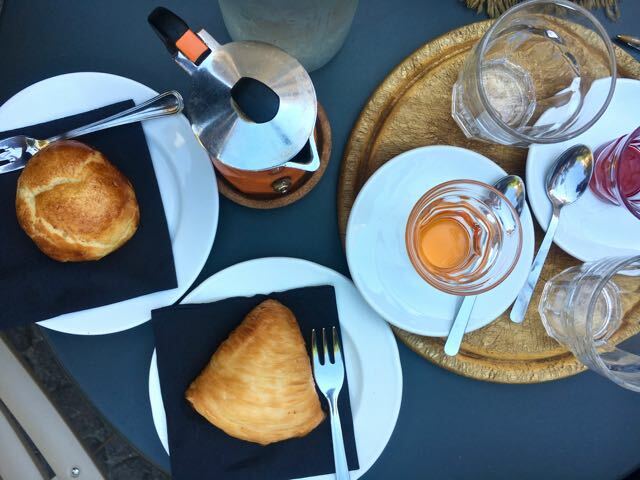 Our day started with food historian Amedeo Colella giving me an overview of the history of Naples and the changing nature of modern tourism over a pot of Neapolitan brewed coffee and a still warm from the oven sfogliatelle. I am partial to the messy sugar dusted multilayered version, but I gave the more restrained frollo (a kind of cookie dough crust) one a try too. 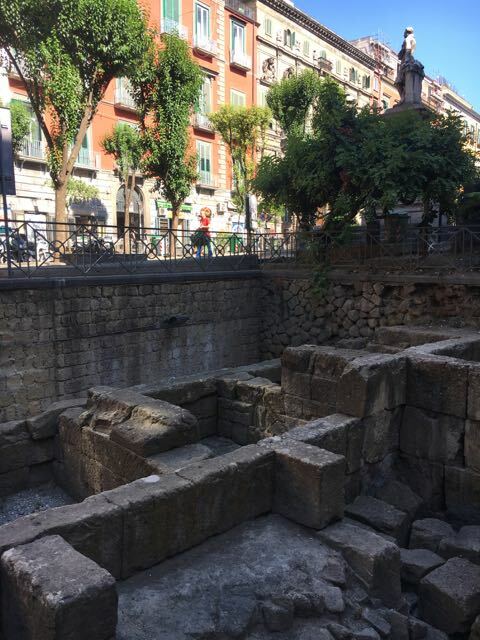 Our view was fragments of an ancient Greek wall that predated the Romans and the soundtrack the classical cacophony of the nearby conservatory practice rooms. 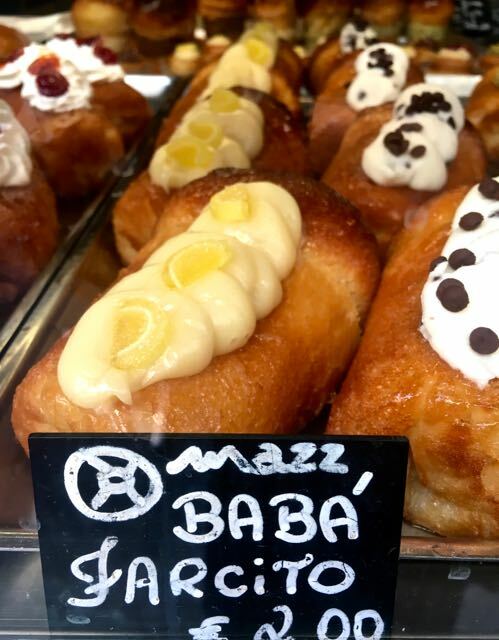 Our next stop was for more pastries on the via Tribunale where we tried classics like the rum soaked baba and learned about its French Providence and quickly moved on to slices of pastiera, a traditional Easter dessert, with the orange flower water swapped out for pistachio. The other place that pistachio made an unexpected appearance was in a Caprese torte, a change I heartily endorse. 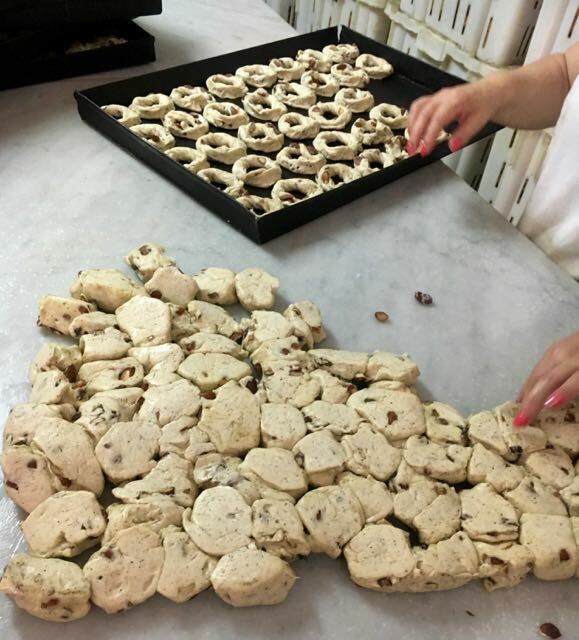 I was ready for some salty to counter the sweet and we walked a few minutes to an unmarked open door where a mother and son were rolling and shaping the savory Neapolitan beach snack taralli at lightening speed. Flour, lard, almonds and a generous amount of black pepper are mixed and twisted into a round ring and then baked into a flaky (and addictive) cracker/pastry hybrid. We made an unscheduled visit to Naples only limoncello factory taking a look at an ancient Roman wall that cuts through the storeroom and trying an ice cold sip of the tart sweet liqueur. Now it was time for some pizza. 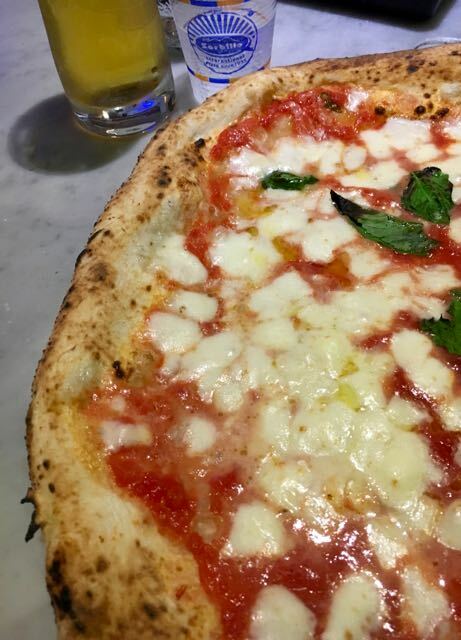 Naples is famous for its wood oven fired pizzas. That means long lines and fierce discussions about who makes it best at the handful of famous and historic places, but that was not what we were here for. Yet. 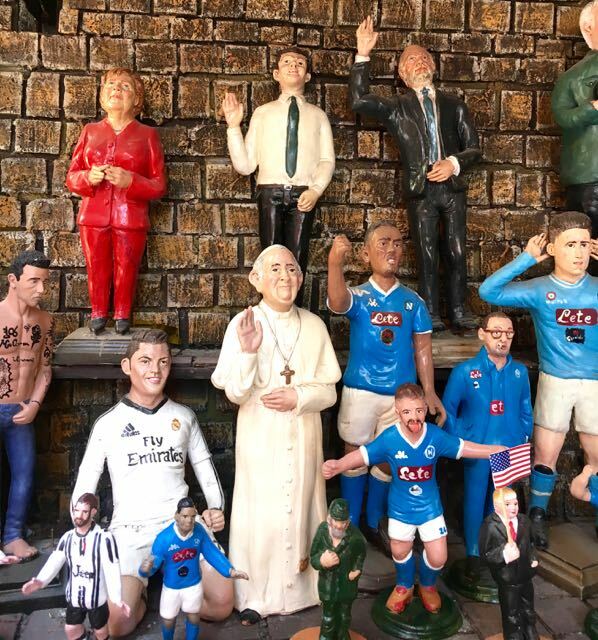 The other thing that Naples is famous for is street food. My favorite thing to eat in Naples is frittatine. Frittatine are deep fried rounds of macaroni and cheese stuffed with peas and a little meat ragu mixed in and are pretty much the best late morning snack ever. Other things to try are croquette, deep fried mashed potatoes, and pizza fritta. Yes, that means deep fried pizza, but more on that later. 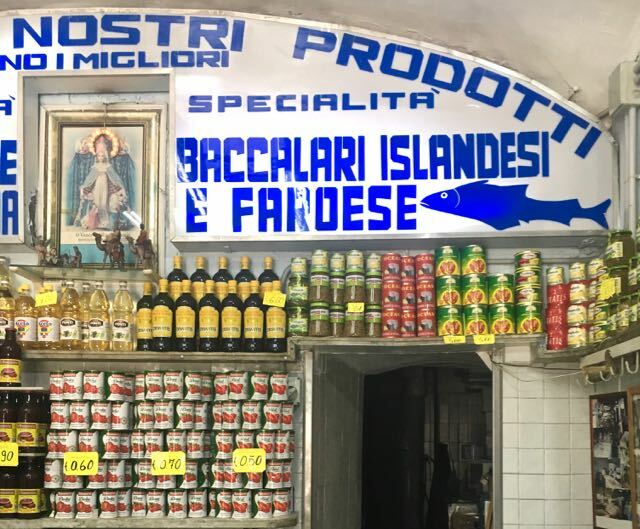 For a palate cleanser, we walked to the gates of the historic center to a shop that has been preparing baccala, dried salt cod, for a few generations. 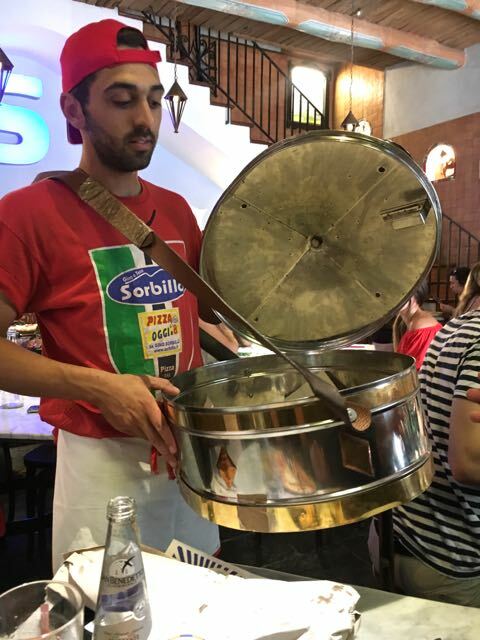 Here in Rome it is soaked in milk and served with chickpeas or battered and deep fried but in Naples the do something completely different. After the fish is reconstituted it is thinly sliced and a given a generous squeeze of sweet/tart local lemon juice and served like sashimi. Now it was time to dive into an open air local market. 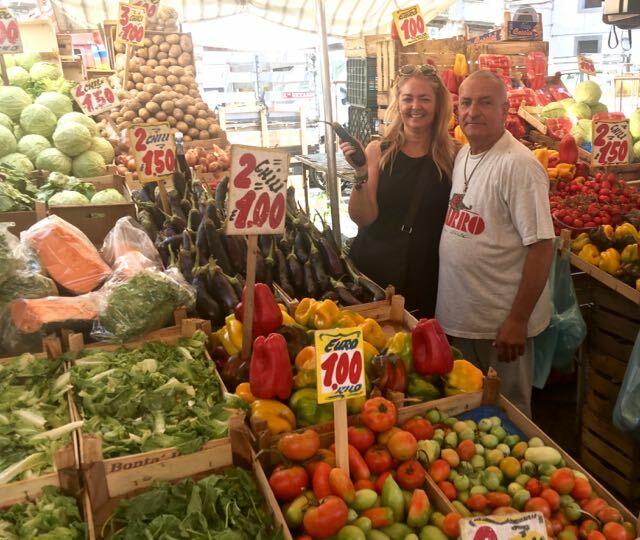 I tried a glass fizzy sulfury water from a spring on the nearby volcano Vesuvius on the promise it was good for digestion and took pictures with a jokey fruit and vegetable vendor before we again found a narrow alley and an open door. Inside was the workshop of Pasquale De Stefano. 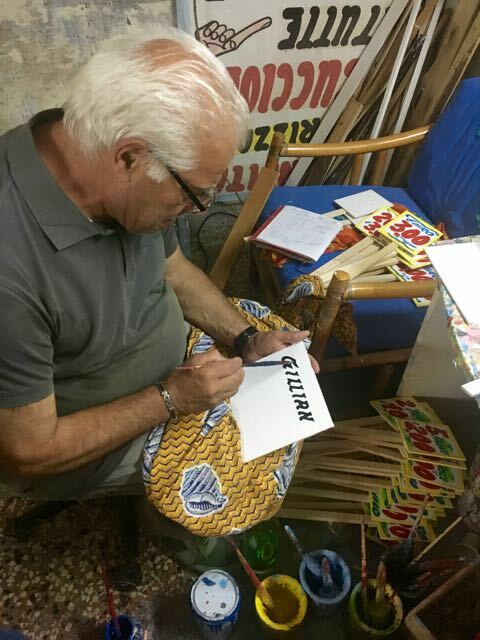 Known in the neighborhood as ‘o nummararo, he hand paints a great many of the signs you see all over town. 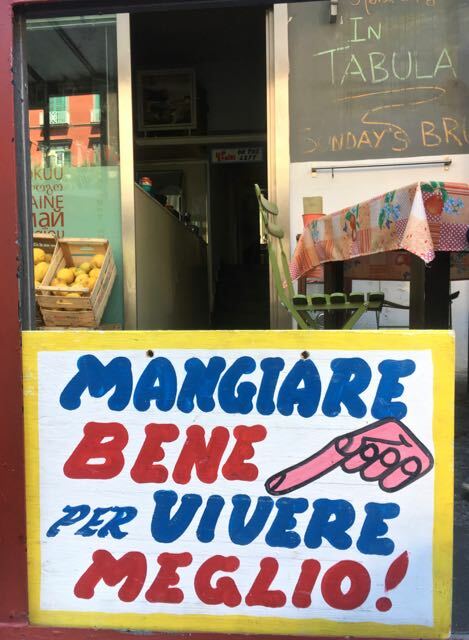 He is behind the thick red letters at Da Matteo’s street side counter, local butcher shops, and almost every market stall. In a matter of minutes, he has painted one for me with my name and the number 15, which I chose because it is my wedding date. It is a perfect addition to my collection of West African haircut and Zimbabwean fishing worm signs that fill the wall in the front entrance of my apartment. 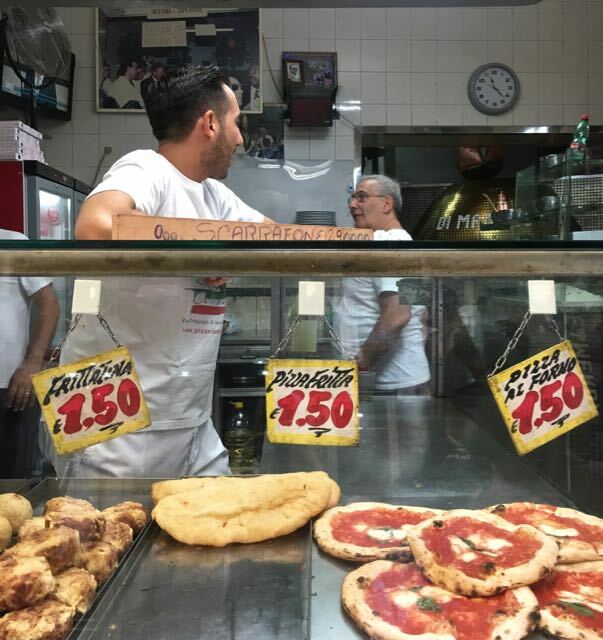 It had been about 30 minutes since we had anything to eat so we found another hidden doorway and met the de Paolo brothers who make freselle from a starter that is said to be decades old. Freselle is twice baked bread that is hard as a rock and keeps for long periods of time. 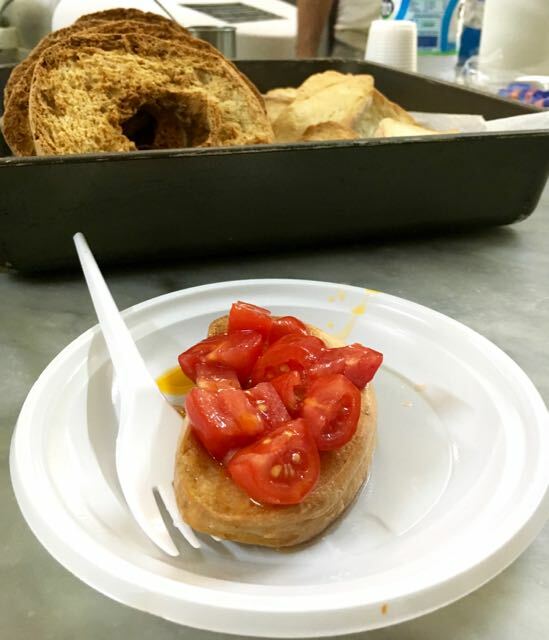 There are two different types, a round one that looks kind of like a dried out bagel and slices that are used for Zuppa de cozze, a rich mussel and tomato stew. To eat them you soak the bread in water for a few seconds, squeeze out the excess water and top it with a mix of freshly chopped tomatoes, onion, and olive oil. Add an anchovy from Cetara and you have my favorite summer lunch. Amedeo insisted that I could not go back to Rome without a Neapolitan pizza so we walked back to Sorbillo on the via Tribunale in the hopes of working up an appetite. I watched as the crowds parted for this self-declared king of pizza and a table magically appear for us. I ordered a classic margherita, which was gooey with mozzarella and has that soft Neapolitan crust, but the revelation was the pizza fritta. Delivered to the table from inside an enormous metal drum like the ones that were once used to sell this snack on the street the pizza crust was filled with creamy ricotta and crunchy chunks of ciccioli, which is lard soaked smokey pork shoulder. I somehow had room for every single bite. 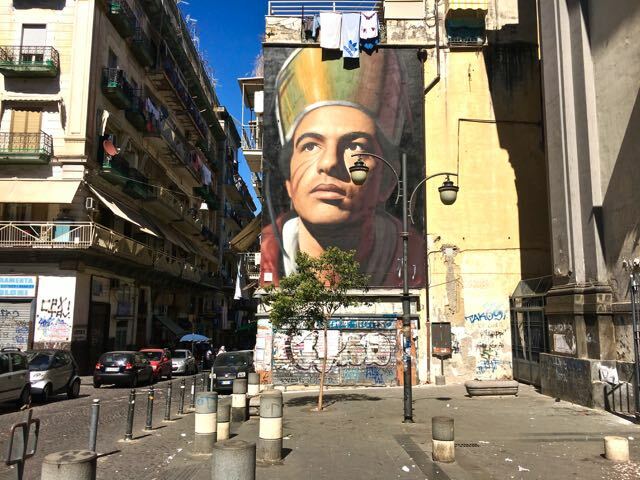 Naples is a very easy day trip from Rome. There is hourly high-speed train service between the two cities and it takes just over an hour. 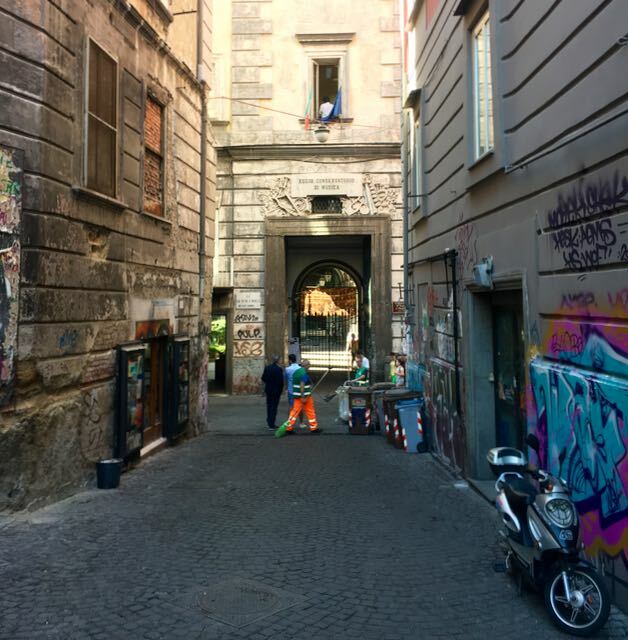 There are neighborhoods in Rome that it takes me longer to reach! I was a guest of Culinary Backstreets. If you would like a discount code to book your own day of eating in Naples send me an email. You can book directly here.